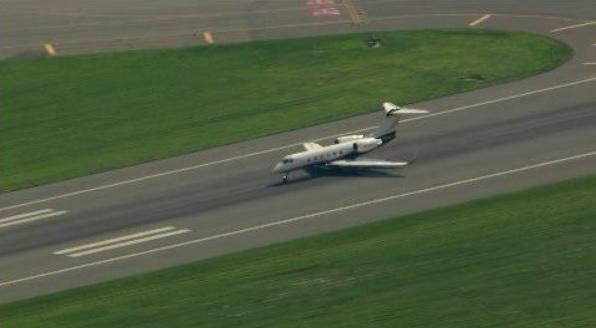 A plane had a close call when its tires blew and was forced to make an emergency landing at Stewart International Airport in New York. The plane was a Gulfstream IV and was carrying the rapper Post Malone and 15 other people to London Luton Airport in the United Kingdom. The pilot of the aircraft was forced to circle for about 30 minutes before the jet was diverted. The flight hovered above Connecticut for several hours before finally landing at Stewart International in New Windsor, Orange County around 4:00 p.m. Post Malone had just performed at the MTV Video Music Awards on Monday night and he tweeted that he had landed safely. Malone spoke with TMZ over facetime saying, "Oh, my God, I hate flying in general. I don't even know what to say, man. I'm shook. There was one hell of a team on that aircraft, and we're here, we're here on earth, and I need a beer, and I need some wine, at the same time, mixed together." Fans of the rapper greeted him at the airport when the plane finally landed. too bad the plane didn't crash. Or landing… and that force an emergency landing?